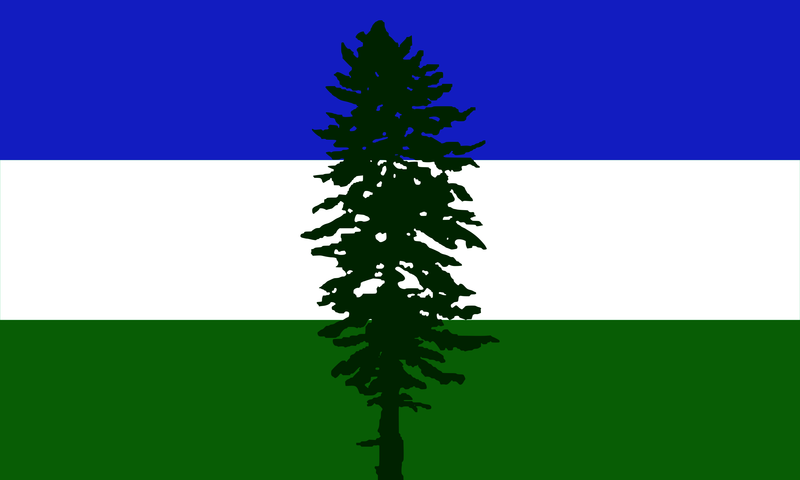 Twenty years have passed since Alexander Baretich designed a flag to represent Cascadia. He’s seen it grow from an epiphany had while pining for his homeland overseas, to a ubiquitous meme adopted by activists, a Native tribe, soccer teams, brewers, and residents of the Pacific Northwest. Baretich is part of a four-person cooperative crowd sourcing money on Indiegogo (campaign page) to bring manufacture the flags to the bioregion of Cascadia. In 2011, he approved finding the cheapest manufacturing price so the meme would spread— understanding that the flag would eventually be manufactured locally. The crowd sourcing campaign is close to its goal, Baretich said. There was a lot of support at the beginning, but donations have dropped off recently. Baretich said they sought support from about eleven companies who used the image. Two responded, and only one agreed to help. He said he was surprised that the companies profiting from the image weren’t supporting the flag cooperative. The infrastructure and materials aren’t available to have every element of the flag made locally, but Baretich said plans are in place to have the flags sewn and printed here. Sales of the flag will help support a living wage for the cooperative members, he said. Eventually he wants to use hemp for the flag, but most hemp comes from China and the best is very expensive. Here’s the video from 2010 of a huge Doug Fir being raised over the Timbers Army. It was at that point I started to search for some means to shift the consciousness of people from anthropocentric (human centered) to one that was biocentric (life centered). I knew whatever that was, that catalysis, it had to be emotion driven and needed to have that “aha” moment or epiphany at the human conscious level. I also knew it was not something one necessarily went out and found, but was something that would reveal itself when it was time. So that began a subconscious search for what I would call a transformative icon. He had his epiphany in 1995, when he was teaching in Europe. While describing his Cascadian homeland to a companion, the idea for the flag suddenly came to him. The colors of the flag, known as the “Doug Fir,” represent the landscape and sky, and the tree represents resilience and defiance against humanity’s destruction of nature, he said. Baretich said he’s not surprised or concerned that the flag has expanded beyond its original meaning. When he was first distributing the flags, people told him it represented independence and secession to them, but now most people say that it means permaculture and an awakening of bio-regionalism. In conversation and on social media, Baretich is quick to defend the idea that the flag represents Cascadia as a bioregion— not a new nation. Secession would just remake the sins of the United States, he believes. Change needs to happen from the ground up, and he has written a list of ten things that must happen before he would support independence for Cascadia. Baretich encourages the public to support the flag cooperative campaign, and help bring its manufacture a back to Cascadia. The Indegogo campaign ends July 14, and they have reached 90 percent of their goal. Indegogo keeps nine percent of the funds if the goal isn’t reached, and four percent if it is.